Afghanistan's parliament on Monday sacked Interior Minister Mujtaba Patang, one of the country's most powerful security chiefs, less than a year after he took office. Patang, accused of corruption and incompetence, lost a vote of confidence at a key point in Afghanistan's transition from NATO to national security control and as the government searches for ways to open peace talks with the Taliban. He lost by 136 votes to 60 in the lower house of parliament, or Wolesi Jirga. "He's lost the vote of confidence and I on behalf of the Wolesi Jirga request the President of the Islamic Republic of Afghanistan to introduce another individual to the parliament for a vote of confidence," said speaker Abdul Rauf Ibrahimi. Patang, a former deputy interior minister and a career police officer, was dismissed a month after the Afghan government formally took responsibility for nationwide security from US-led NATO troops at a handover ceremony. He has been widely accused of incompetence since taking on the portfolio, one of the most powerful security positions in the country. Unlike former warlords who dominate Afghan politics, he lacks a strong personal power base. Patang defended his record in response to a barrage of accusations from the floor. He said 2,748 Afghan police had been killed since March 21, an astonishing rate of around 22 a day from an overall police force of 157,000 in Afghanistan. There was no immediate independent confirmation of those figures. Afghanistan's 350,000-strong security forces are suffering a steep rise in attacks as the NATO combat mission winds down, with police and army casualties previously said to have increased by 15-20 percent since 2011. Patang likened the ministry he had inherited to "an old car with a broken engine". Afghan and foreign money had been wasted, he said, because there was no system. "In eight months I have created (a) system. I have made 122 policies and strategies for the interior ministry," he said. Instead, other people were responsible for insecurity, he said. In another example of Afghan public officials lashing out against their US backers, he accused an American convoy of paying $1 million to the Taliban in bribes to get to Badghis province when he was police commander of northern Afghanistan. "A long convoy of Americans came and said 'we'll go to Badghis' - I said how will you get to Badghis? He said 'through (the notorious Taliban hotbed of) Ghormach.' I said Ghormach is dangerous... he said 'don't worry about that," Patang told parliament, apparently quoting an unnamed US military official. "They took the convoy through and when I checked, they had paid $1 million to the Taliban." When MPs held him responsible for deteriorating security between the Afghan capital and Maudan Shahr, the main town of Wardak province to the southwest, he also blamed others. He said "people" who had lost private security companies, many of which have been dissolved by the government, pay protection money to the Taliban, which enabled them to buy more weapons and kill more people. The Islamist insurgents in return turn a blind eye to those who had paid "whether they are Afghans or foreigners," he said. Patang was approved by parliament in September 2012, a month after the lower house sacked his predecessor Bismillah Mohammadi, allegedly for failing to stop a Taliban resurgence and cross-border shelling from Pakistan. Lawmakers approved Mohammadi's nomination a month later as defence minister. The cabinet reshuffle at the time was interpreted as an effort by President Hamid Karzai to secure his powerbase before anointing a successor to stand in presidential elections next April. Karzai has led Afghanistan since the US-led invasion removed the Taliban regime in 2001. His government has been widely criticised as weak and corrupt, and for failing to address perceptions of worsening security as NATO troops withdraw. 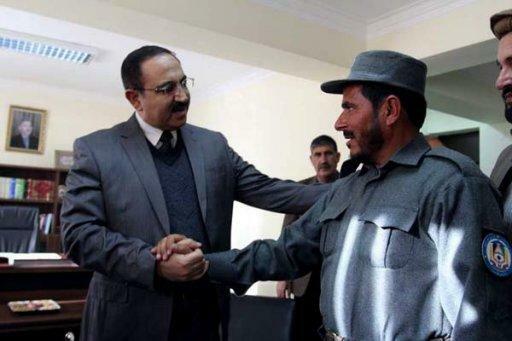 Afghanistan's Interior Minister Mujtaba Patang (left) speaks with a police officer in Kabul, on December 25, 2012. Afghanistan's parliament has sacked Patang -- one of the country's most powerful security chiefs -- less than a year after he took office.